Get ready to “hop” everybody! This is going to be a super hop featuring the talented designers from UStamp! Dawn came up with a fun idea for a hop with FREE PDF’s for all projects posted. Hop begins June 10th and runs through June 12. My card features some techniques that are great for vintage projects. Besides the fun Blog Hop coming in a few days, I have some really exciting news… My husband and I are having our first child:) I am 5 months pregnant with a little girl. That’s my big excuse for these past couple months of absence, well that and my new job with an added 45 minute commute and all the SU events I tried to pack into March and April. Now I can breathe and it feels nice. I found I also really enjoy taking naps on the weekends, its awesome. I’m not giving up my love of papercrafting or my Stampin’ Up business, I’m just trying to find a place where it all can live and thrive harmoniously. The project I have to share with you is one that we did a week ago at our stamp club meeting. It uses the Fabulous Florets set and the Beyond the Garden DSP from the Summer Mini. The flower was stamped in Stazon, then watercolored with a mixture of Marker, Ink Pad and Blender Pen. All the coloring made the center details very light, so I went over the lines and dots with the Basic Black marker to help bring them back to life. Thanks for stopping by! Hope to see you again really soon. This is stunning! How do you achieve such a beautiful watercolour look using just ww and blender pens? I can only get mine to look like that if I actually use watercolour paper but sometimes I don’t want to because the background isn’t white enough if I’m not trimming it down. the card is sooo pretty – love the colors. Well first Congratulations! Very exciting news for you and your husband! 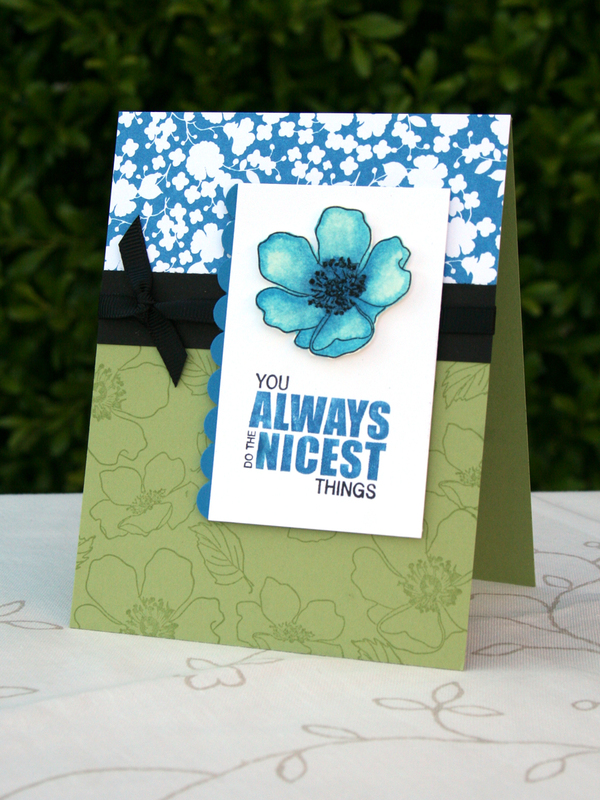 Your card is beautiful and I look forward to doing the blog hop. However, what happened to the Classes, Clubs and Workshops? ?